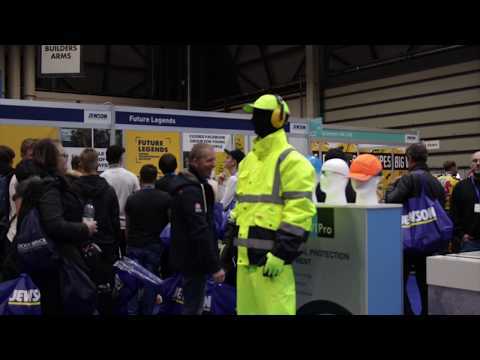 Following on from their successful exhibition stand in 2017, our brief from NoviPro for the 2018 Jewson Live event was to re-install the existing exhibition stand but to add a new interactive twist that got people talking. Of course the biggest benefit from a re-install is a substantial cost saving. One of many advantages to using our sustainable display system. Personal Protection Equipment (PPE) is just one example of the products available under the NoviPro brand. And we thought it would be a great idea to have a human mannequin dressed up in PPE to prank the visitors. Our mannequin proved to be a massive hit with visitors. People were bringing their colleagues over to the stand to film them being spooked by our mannequin coming alive. These clips were shared on social media where it got a lot of great feedback. It also got everyone laughing and engaging with the product which is exactly what we wanted it to do. It was important for NoviPro that visitors to the stand were able to get hands on with their products. Using display troughs allowed for the products to be picked up.